You are currently browsing the category archive for the ‘Author’ category. [yuri book] Pages for You ~ a sad (VERY) but worthwhile read! You’ll need tissues!! Somehow I came across this book called “Pages for You”. I think I was going through the recommended books over at AfterEllen (can’t find the exact link!). I really liked the name of this book and was struck by the idea behind it. It carries with it a certain air of elegance. It is called ‘Pages for You’ because it is written by a woman, years later, to her lost love. The notion is heartbreaking and even as I write it now (I finished the book last night), it brings tears to my eyes. What would happen if I wrote some pages for you? Each day a page, to show you that I am finding a story, the story of how we might have been together, once. Of how we could be. It took me a long time before I took the plunge. I could sense the sadness waiting for me and I was worried it would become all too overwhelming. Like it would pull me from the fantasy world that I have been reading about in the other books. Pages for You is written in four parts. A prologue and three parts which covers the initial attraction, the relationship and the breaking down. The story is between Flannery Jansen and Anne Arden. Flannery is an out of town 17 year old girl who is starting her first year in college. She’s a quiet and kind one, coming from a small town. She feels a bit overwhelmed and lost by her new surroundings. One day whilst having breakfast at a dingy diner, an older woman catches her attention, Anne. Anne, of french descent is attractive but has a cool guard with striking green eyes. Anne seems to carry the natural pull of attention from people but she’s not the type you would describe as sweet or kind. After a short case of embarrassment, Flannery dashes out of the diner but later to find herself bumping into the face again, unexpectedly. Anne is a graduate student at her college. When I first read the book, I was a bit overwhelmed by the style of the writing – not in a good way. As Flannery is a student of literature, the writing is quite figurative. Another key difference to the other books I have recommended in the past. It took me a while to get the hang of it. Another problem I had was that I didn’t “get” the attraction. One of the things Flannery was drawn by was the way Anne smoked. However, having said that, once I got past part one, I was on a roll and was starting to get into the story. At first Flannery seemed very unworldly to me and this was mentioned many times in the book by Anne as she was a few years older but half way through the book, I came to realise that Flannery was indeed an amazingly perceptive person. She sensed the warning signals and knew how to handle Anne (in most cases). By the end of the story I was blown away by Flannery’s strength and courage. In the last third part of the story, it becomes quite an emotional roller coaster. Get the tissues ready. Some of the things that Flannery says are like a blow to me. I would love to quote sections but I don’t want to ruin it for you guys. Maybe we can discuss later in the comments or I can have a separate post if you guys are interested. By the time I finish the last page, I turned back to the Prologue to read it again. It makes more sense now and I just hope with all my strength that Flannery will move on. You can get hold of this book here (paperback / ebook). [bOOk] Imagining Reality ~ READ THIS!!! But need some tissues!!! Jessie is tall and striking and has a body to die for, we are told. She is an ex-Olympian and is the co-owner of a boutique gym (aka the local lesbian gym! HAHA). She was introduced in the first book as a player having dated many MANY lesbians in Charlottesville. There are plenty of ladies buzzing around her, ready to pull her into bed. However, it also hinted that maybe there’s more than what meets the eye. She was the one that had a one on one talk with Austy and helped pinned down what her confusion was and how she should not let Elise get away. Lauren is Austy’s best friend. Lauren is currently running her own law firm and she seems pretty good at it! She has red hair with a pale complexion that is dotted with freckles. Tall and on the lean side but nevertheless attractive. She’s a hopeless romantic and wishes she can meet someone to be with forever. Lauren’s had a few bad experiences where she emotionally got carried away early on and ended up being hurt when her love was not reciprocated. Basically, she might be intelligent and kick arse in court, but relationship wise, she’s pretty much a newbie. Jessie and Lauren have known each other since college but they’ve always just been friends for each other. Although it’s been so many years, it’s surprising how little they know of each other at times – especially for Lauren. I thought this book was better in that I liked both characters here (Austy annoyed me a little), I enjoyed reading the author peel back Jessie’s layers to show us what’s underneath. The friends around them also added a lot of fun – especially reading about Austy and Elise! I liked Austy here more than in book 1 – probably because we didn’t see her “speaking to herself” dialogues. [bOOk] Wasted Heart by Lynn Galli ~ it’s worth checking out! What happens when you fall in love with your best friend? Will you ever move on? It’s an interesting centre piece and it definitely made it stand out from the rest. The main protagonist is Austy – an attractive, petite prosecutor who with her appearance and brains, should very well be attached to another woman. However, she’s hung up on her best friend, Willa, and it’s not because she’s straight, but because she is already partnered up with another good friend of hers. Austy is a wonderful person and would never hurt either of them so she decides to move away from Charlottesville, Virginia to Seattle. She needs to start a new life and stay away from her best friend – at least for most days of the month. Conveniently, Willa has an office in Seattle and is there like once a week (something like that). Austy is desperately trying move ahead with her life and it doesn’t get better when a wonderful distraction like Elise enters into her life. Elise is a FBI agent and became acquainted with Austy after she was her expert witness in a few cases. Can Austy forget about her best friend and find new love? The book picks on an interesting enough idea, but I felt that we did not see enough internal struggle within Austy. I felt that was one of the key weaknesses of the book. The chemistry between the characters is definitely not as strong although the “intimate” scenes are definitely in a lot more detail!!! *gets a fan* Compared to “And Playing the Role of Herself“, the writing also pales a little. Call me nit picky but I’m sure there were a few errors that the editing should have picked up. I did kind of like the colourful bunch of friends that was in the backdrop of the story. Some I wouldn’t mind knowing more about. On the whole it was an enjoyable read. I’d give it a 7 out of 10. I’m checking out the other books of this author as I know she has written books on some of the friends in this book. Now THAT I am quite interested in!! [yuri bOOk] And Playing the Role of Herself by K. E. Lane ~ a must read for all yuri romance fans!! I absolutely love this book!!!! I’m trying to refrain myself from going on and on about it cos I don’t want to raise the bar too high and cause disappointment for others. For those who read my blog, you will HAVE to read it. I will accept no excuses. If I could I would make you drop everything and read it now!!!! Hahaha I actually re-read the book immediately upon finishing it and proceeding to finish it for the 3rd time!! Btw the quickest way to get this is via Amazon (book and e-book). The reason why I have enjoyed the book so much is that we get to see the initial stages of the relationship i.e. a lot of flirting, blushing and SQUEAL-worthy moments! In my opinion. at least! I also find the backdrop to be very rich. We are not just reading about Caidence and Robyn but also about the characters around them, their work, their family and their past. All the characters are very much alive to me!! I love reading about them all! I was completely engrossed into this book and was sad when I came to the end. I wish I could read more about the two. *cries*!! Everyone, you must check this book out!!! I plan to start exploring for more yuri books to read. If you have any suggestions, please let me know! I am also happy to post up guest reviews!!! If you do get a chance to read this, please COMMENT!!! I want to squeal together!!!!!! Warning: There may be some minor spoilers!! I have read 3 chapters so far. First up, I want to be clear that this book is quite a “first” for me. I don’t usually read books that are so intense in emotions. The book focuses on the hardships that Zoe, aged 40, has had to go through. Nine years of marriage and all that time, trying to have a baby with her husband Max. They’ve spent all their savings, time and energy into this but the pregnancy fails again for the 5th time. Max is exhausted and calls for a divorce. He cannot take it anymore and relapses into alcoholism. He feels like a failure and lives like one too until one day he finds himself saved by the church and becomes a newborn man. To be honest, I find his character quite unattractive to read. I understand that depression can tear you apart and pull you into an abyss deeper than you thought imaginable, but I like reading about strong characters much more. Then there is Zoe, a music therapist. There is no hiding the fact that she’s desperate to have a baby but putting that aside, she is actually a very charismatic person! She’s optimistic, playful and comes up with crazy ideas like – isn’t a smoking section in a restaurant a little like a peeing section in a pool? Or her theory of, you must order Goobers too (on top of butter popcorn) because a romantic comedy and those are never quite as good without chocolate. She’s a surprisingly fun person once you take her away from the baby issue. The best thing? She doesn’t even flinch when she finds out that Vanessa is a lesbian. Yep – she’s pretty cool! Then there’s Vanessa. She’s a school counsellor and a self-identified lesbian. We learn a little about her self-discovery in her younger years, how she soon realised that little girls don’t normally think of getting married with their girl best friend so she played along with the rest of girls in her class and said she was crazy about this one boy. This bit was not exactly “WOW” but it was interesting and some parts you would think “I’ve heard that before”. There were a few points that she mentioned that had crossed my mind before. She comes across as being quite logical and sensible and best of all NORMAL! She’s like any person that you might bump into at the shops but she so happened to have a female partner. The unexpected thing about this book is the way it is written. 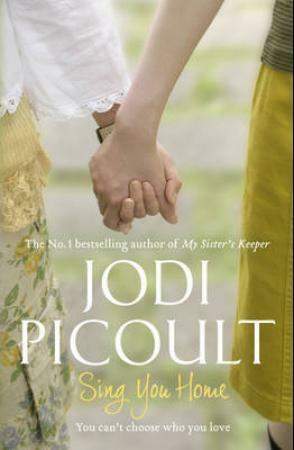 Jodi has written each chapter from the view of one of the characters. When I first started reading chapter 2, I was like “huh?! Did the font just change?”. She not only dedicates each chapter to one character but the font also changes. It’s an interesting way to write and I haven’t decided yet whether I like it or not. So far, I feel that it splits up the story too much and it loses the flow. Anyway I’ll keep reading to the end. I remember my mother telling me that, when she was a little girl in Catholic school, the nuns used to hit her left hand every time she wrote with it. Nowadays, if a teacher did that, she’s probably be arrested for child abuse. The optimist in me wants to believe sexuality will eventually become like handwriting: there’s no right way and wrong way to do it. We’re all just wired differently. It’s also worth noting that, when you meet someone, you never bother to ask if he’s right or left handed. After all, does it really matter to anyone other than the person holding the pen? Jodi Picoult is a well known author with her most famous work probably “My Sister’s Keeper” but don’t take my word for it because I have actually not read a single book of hers. It has crossed my mind in the past but her books always seemed a tad heavy and full of emotions. I prefer my light reading and to be honest, I just don’t have that much time to read. Anyway, she just released a new book yesterday called “Sing You Home”. She has chosen a subject that has been quite topical in the US media. The rights of gay people. The story is about Zoe who failed many times to successfully conceive a child with her husband. Eventually their marriage breaks and they go their separate ways. She focuses on her career as a music therapist and it is at work where she meets Vanessa, a counsellor. They first begin as colleagues, then as friends then finally, as lovers, to Zoe’s surprise. To add a further twist to the story, Zoe’s desire to be a mother resurfaces and she remembers the frozen embryos that she had with her ex-husband stored away. Will her ex-husband let her use the embryo for Zoe / Vanessa’s relationship? It will be a difficult battle as her husband has since found peace in a church that is explicitly against gay rights. I have never read a book like this and I’m not entirely sure whether I will like it. I’ll give it a go. Let’s see how long this will take me. I’m aiming to write a review post of this book in a month. Wish me luck!! Does this book interest you? Check out the author’s website. There’s more info!